How do I run by business better to stay ahead of competition? How do I remain compliant in an increasingly regulated system? How do I tackle one of these concerns without burdening the other? While these stakeholders play different roles in the supply chain, technology can answer each of their needs with a vertically-integrated solution that tracks inventory from seed to sale. That’s where Flourish comes in. In a functionally dependent and highly regulated industry, cannabis stakeholders need a vertically-integrated technology solution that gives detailed attention to every plant, whether at the cultivation stage, the manufacturing stage, or the distribution stage. A company may handle one, some, or all of these business operations. Cultivation. Flourish keeps track of the growth phase and physical location of each individual plant by strain and by group, whether an immature clone group, a mother group, or a vegetation group, at all growing phases through drying, curing and harvesting – to ensure accuracy and compliance. Manufacturing. Each batch of raw material is captured and tracked once it is ready to be transformed into oil, edible, or some other form. Flourish is built to handle the complicated intricacies of the extraction process whether you have a one step process to produce crude oil or if you have a multiple step process to refine that crude into a finished distillate. Flourish can also track and report multiple source packages of raw material that are then used for one final output. Flourish assigns the new state track and trace tag while it consumes the source tags and reports back to the state system and also keeps record of this transformation inside for future reporting and data analysis. Distribution. Flourish tracks all inventory in real-time so that a distributor knows where every cannabis package is located at all times with transparency and accuracy. Flourish also makes it easy to take one large source package from a producer or processor and then break it down into smaller, more salable quantities that are easier to use for sales orders and more granular tracking. Flourish allows businesses to record and monitor each plant’s life cycle at every stage, enabling operators with real-time metric tracking and valuable data around each plant’s performance. These insights make it easier for operators to automate business processes, data collection, and management, which in turn results in optimized yields – saving time and cutting costs. So, where does compliance fit in to the operational efficiency value proposition? 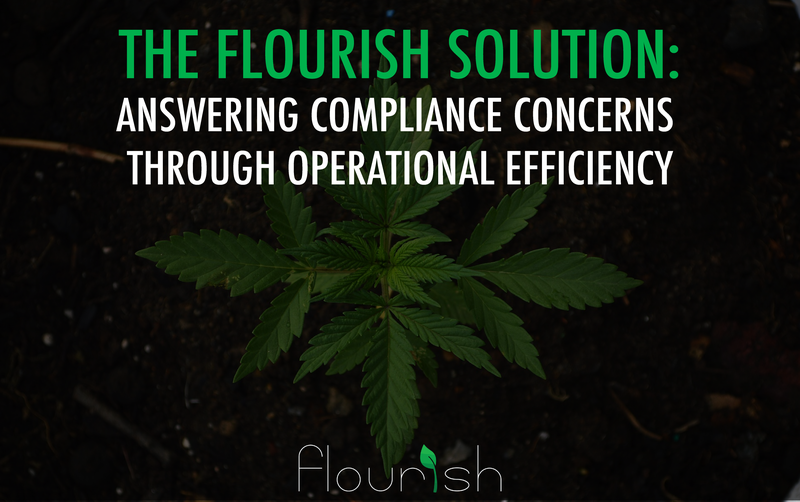 Flourish aims to make regulatory compliance a product of operational efficiency. This comes from seamless inventory management throughout the supply chain that not only keeps track of every plant, but also ensures easy state reporting. Flourish integrates with METRC, the state compliance software currently used in Alaska, California, Colorado, D.C., Maryland, Michigan, Montana, Nevada, Ohio, and Oregon. When every step in the day-to-day operations of a business are coordinated to adhere to regulation, compliance becomes an embedded result. Throughout June, we’ll walk through what Flourish’s solution looks like on a granular level for each stakeholder – starting with the cultivator. Learn more about how Flourish helps you optimize your business.